This Bald Eagle (Haliaeetus leucocephalus) dropped more quickly than I anticipated when it took off last Friday at Occoquan Bay National Wildlife Refuge, but somehow I managed to keep most of it within the frame. Whenever I see an eagle perched in a tree, my mind starts to go into overdrive and my fingers get twitchy. Should I take an immediate shot or should I try to get closer? If I manage to get closer, should I zoom in all the way to capture the perched eagle or leave room in the frame if the eagle decided to take off? I try to anticipate what is going to happen, knowing that I will most likely will have to react to a scenario that I hadn’t predicted. 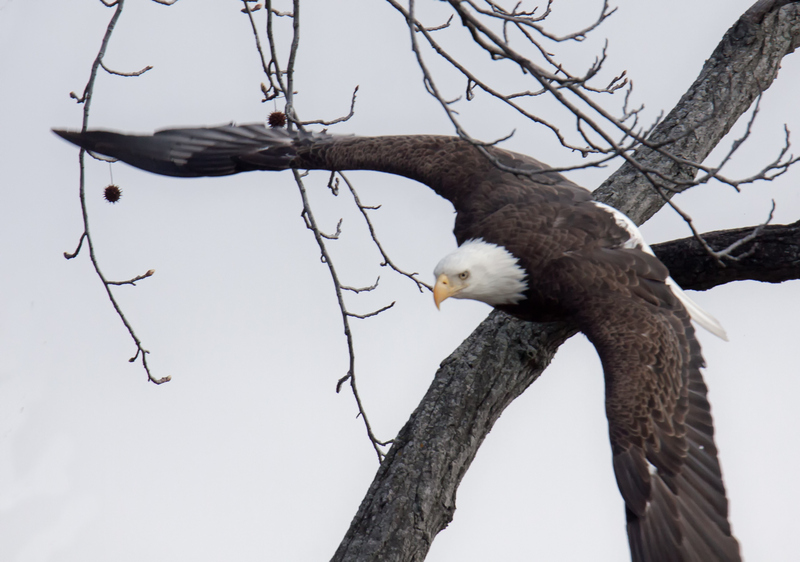 This eagle, for example, did something unusual—it initially flew towards me. In my experience, eagles almost always fly away from me when they take off. A bird flying right at you is a real challenge to photograph. My focus on the eagle’s eye was off a little bit, but I was very happy to capture an image in which I am looking straight at the eagle’s face from in between the wings. Growing up, I was a member of the Boy Scouts and the Scout motto of “Be Prepared” serves me well when I am trying to photograph wild creatures like this bald eagle. I think a large raptor flying straight towards me would have me entirely failing to take its portrait so congratulations for keeping clicking in the first place let alone getting such a well composed and sharp image.